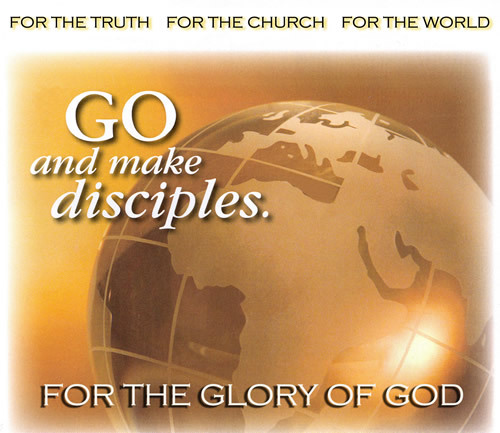 Go and Make Disciples | Joe Quatrone, Jr.
Posted on June 10, 2014	by Pastor Joe Quatrone, Jr.
Then the eleven disciples went to Galilee, to the mountain where Jesus had told them to go. When they saw Him, they worshipped Him; but some doubted. Then Jesus came to them and said, ‘All authority in heaven and on earth has been given to me. Therefore go and make disciples of all nations, baptizing them in the name of the Father and of the Son and of the Holy Spirit, and teaching them to obey everything I have commanded you. And surely I am with you always, to the very end of the age’ (Matt. 28:16–20). Imagine you are one of the eleven disciples who met Jesus on the mountain. Three years ago, you received the call to follow Christ and you left your family, friends, and livelihood to do so. You have been fascinated by this Man who can heal the sick, raise the dead, and preach with an authority that draws multitudes to hear Him. You have lived with Him, trying desperately to understand this Man who is so different from everyone you have known before. You were present on the night He was taken by the mob to His crucifixion and you ran. Three days later, while you were still in hiding, you heard He had risen, and you were terrified and relieved at the same time. You have seen Him a number of times since His resurrection and now as you meet Him on the mountain, you realize He is preparing you for yet another good-by. In these last words of Jesus—which you will reflect on many times in the coming days—you receive your final instructions or formal “commissioning.” There is no mistake about it that Jesus is giving you a command that is to be followed. As His disciple, you are to respond in obedience. But what is He telling you? There is one thing Jesus says that is crystal clear. It is His command to “go and make disciples of all nations.” As His disciple, you know very well what He means. The original disciples learned how to think and act based on their relationship with the master disciple-maker: Jesus. They in turn began to duplicate His kind of ministry after Jesus went back to heaven. In the book of Acts much can be discovered about the history of the church. Following Christ’s ascension into heaven, the promised Holy Spirit manifests in power at Pentecost, and the disciples start carrying the Good News to all people. It was an exciting time for the church, a period of rapid growth in spite of tremendous persecution. Peter’s sermon in Acts 2 brought three thousand new believers into the church in one day! These new believers combined with other disciples to worship in the temple each day. Their lives were so different that they were viewed favorably by others and the church grew rapidly. From the beginning the church met together in larger groups for corporate worship, but small groups also had a place in the life of the church. The apostles not only taught large groups, but they also went from house to house, visiting small groups in homes as they taught and made disciples (Acts 5:42). People met together in homes to break bread together and to encourage each other to live out their faith in ever greater obedience. There were home prayer meetings like the one held while Peter was in prison (Acts 12:12) and Paul’s letters speak of “house churches” (Rom 16:5). Whether house churches were independent groups of believers or were part of larger churches is uncertain. It is likely, however, that small house fellowships were the building blocks of the church in each city or region. The early disciples met in groups small enough to fit into normal homes. The church needed the “house church” for its survival. There were periods of intense persecution for the first few centuries after Christ, so the early church was often not able to meet openly, nor were they allowed to purchase large buildings for gathering. They relied on the more protective environment of the home to nurture and protect the gospel in the lives of believers. Miraculously, the church was able to multiply without large buildings, mass meetings, and a plethora of “how to” books! A fascinating aspect of discipleship is that Christians in the twentieth century are in the direct line that can be traced back twenty centuries to the original twelve disciples. In 2 Timothy 2:2, Paul illustrates the process of making disciples: “And the things you have heard me say in the presence of many witnesses entrust to reliable men who will also be qualified to teach others.” All disciples of Christ have been entrusted with the gospel message, which we are to continually invest in the lives of others. Rather than ending with us, the process must begin again with us, as with each new generation. Learning to live as a child of God in our culture is a formidable challenge. Many people feel uncertain, others overwhelmed. While there are many people who can teach others how to flip pancakes or play sports, it is even more vital that there are people who can show others how to live the Christian life. Disciples are made intentionally. Just as children don’t grow up without personal care, so discipleship will not occur without faithful Christians being intentional about it. The word discipleship is a catchphrase in the church today, often without meaning. As a result, some people think of discipleship when they think of Bible-study workbooks or adult Sunday school. What they forget is that the process of making disciples is a dynamic relationship between fellow Christians and their Lord, and it is marked by continued progress. Making disciples must be intentional in order for small groups to take root and grow. You and I cannot pay “lip service” to disciple-making or look at it as one aspect of ministry. It must be the goal of all ministry. Our goal is that people will come to faith in Christ and then grow to maturity as His disciples. Disciples are to be like Christ. Have you ever watched a group of people, perhaps children, who are devoted to a particular celebrity and dress, talk, and walk like the individual they idolize? It is only natural to emulate someone you respect and look up to. And since “disciple” means “imitator,” disciple-makers become models to those who are learning to follow Christ. We must be careful not to duplicate ourselves, though. It is very easy to cross the line from being respected to being idolized. Instead, our task is to help develop partners in discipleship. We must strive to be able to say (paraphrasing Paul), “We first imitated the Lord and then you learned from us how to imitate the Lord” (1 Thess 1:6). It is often difficult, however, for modern Christians to picture themselves as disciples. We ask people if they are “Christians” instead of if they are “disciples,” as if a person could be a Christian without being a disciple. In the early church, followers of Christ were called disciples until someone in Antioch thought of the term Christian (Acts 11:26). There is nothing wrong with using the word Christian when it is properly understood because “Christian” means “little Christ” or “belonging to Christ.” A disciple imitating Christ does belong to Christ. But who decides what it means to be like Christ? Is there anywhere to go for answers? Yes! We can go to the textbook for discipleship: the Bible. One of the disciple-maker’s key tasks is to direct disciples to the Word of God. Growing disciples must spend time in God’s Word on a daily basis. If we want to make disciples the Bible can show what it means to be like Christ. The Bible is the only reliable source for knowledge on how to live an obedient and meaningful life. Luke wrote his Gospel “so you can know the certainty of the things which you were taught” (Lk. 1:4). John wrote “so you may believe Jesus is the Messiah, the Son of God, and that by believing you may have life in His name” (Jn. 20:31). Disciples are made in relationship. From the beginning of our lives, we learn by watching others and then imitating them. Children learn to walk and talk (among other things) by watching others. As you think back over your life, you can no doubt think of many things you learned by watching, learning, and then imitating. This is how we learn to ride a bike, drive a car, and play an instrument. It is also how we learn to “act cool” in high school, move up the social ladder in adulthood, and age gracefully in older years. In short, we learn about life in community by watching others and then imitating them. The Christian life is exactly the same. There is no example in the Bible of a lone ranger disciple. Even Paul, after his dramatic conversion and long stay in the desert, went to Jerusalem and associated himself with the apostles and later with the church at Antioch (Acts 9:26-30; 11:25-26). When he planted churches, he always travelled in the company of others. He had a team-relationship at different times with Barnabas, Silas, and Timothy. The relational, community-based model of disciple-making had been demonstrated by Jesus and the disciples, and it provided the necessary support for Paul and the early church in the turbulent period after Pentecost. Since we learn best in relationship, we most effectively learn to be disciples that way. But disciples produced through loving community in churches today are too rare. The self-sufficient individualism of Western culture has seeped into the church and led to situations in which individuals are trying, often without notable success, to mature alone as disciples. Many resources—Christian books, videos, conferences—are available for these lone disciples to increase their knowledge about Jesus, but an accumulation of facts and ideas is only the beginning of Bible-based disciple-making. It takes a community of fellow disciples who can help each other learn to live a life transformed by the Holy Spirit. The aspect of “growing in community” is such an important concept in this process of making disciples. Without a community in which we can learn, practice, fail, and eventually move out from as agents of change, we are left without a secure foundation. Without a foundation of community, it is difficult to grow in our walk with Christ. Who has been the most important influence in your spiritual life to help you grow? What characterizes that person’s life? This entry was posted in Topical and tagged Acts, Christian, Church, Church Growth, Disciple, Discipleship, Great Commission, Jesus, Relationships. Bookmark the permalink. Thanks Gail! I did not realize one of the reviews was yours. It seems you are using a different name on Amazon. I just clicked on the name Doty Lair and sure enough there you were. Your review is great. Thanks again. God bless! A wonderful message Pastor Joe and very True, Jesus did tell the Disciples and the woman who ministered with them to go in His name after Pentecost and share the Gospel and it is for us too as you said about all True believers. They like us did so in their God given role, woman are were never to be in a position of Authority over men, this is an error added to some Translations later but both men and the woman witness in the Spirit, not because they have to but because they want to. The Holy Spirit is not Mute and longs to bring glory to God and to save His Children, just as you seek to do Pastor Joe, you are passionate to share God’s Truth and I pray you will always have the opportunity to do so. The three thousand believers who were added to the Church in one day, after Pentecost included those who were baptized for their sins by John the Baptist. Water Baptism or sprinkling does not save us but it does show our Identity with Jesus when we believe, as His did with the Father and it shows our Faith in Him as our Lord and Saviour who forgives past sins when we repent of them, Children who do not understand are under God’s grace. We need to be Born again through The Holy Spirit which is what happened as the Disciples were praying in the upper room for Him to come and as we know He did come with tongues of fire and so they were Baptized in The Spirit too as were the three thousand believers and many others later. John 3:5 Jesus answered, Verily, verily, I say unto thee, Except a man be born of water and of the Spirit, he cannot enter into the Kingdom of God. That which is born of the flesh is flesh; and that which is Born of the Spirit is Spirit. Mark 1:8 8 I indeed have baptized you with water but He shall baptize you with the Holy Ghost. Yes as you shared also Pastor Joe the early Church meet in their homes and also went to hear the Scriptures in the Temple everyday, they did not just worship and fellowship on Saturday or Sunday, Jesus was the fulfillment of the Sabbath and Christians were now part of the New Covenant in Him, which also changed the Jewish food laws but it is for each of us to decide what day we worship and what we eat, we are not to be judged by man for these but they do show our Maturity in Christ Jesus and if we are depending on these to save us. P.S I have sent you three e-mails Pastor Joe explaining that I can’t open your P.D.F files but you keep sending them to me which could mean your not receiving my e-mails. I do not like using a WordPress e-mail address for that reason, so please do not contact me using one, you can Trust me not to seek to harm you if you send me your own personal e-mail address as I trusted you when I sent you mine but I will be deleting the one you are using after I hear from you and I will than give you a new one but not through WordPress again, I found words had been deleted. Did you receive my e-mail in answer to your question about Hillsong? Lol. The book is short, so I would suggest doing your review within the next 2-3 weeks. Thanks! Your book may be short Pastor Joe but you haven’t forgotten how long my comments are have you? Lol OK OK 3 weeks Max! Your comments may be longer than my entire book, Anne! Lol. OK 3 weeks Max, I will let my Ghost writer know too. Great post! To answer your question, I have a co-worker who evangelizes by example. I truly believe that my friend, Joshua, is an example of what Jesus had in mind for the future of His church. Indeed, lifestyle evangelism is the best way to share Christ with others! Pingback: New Series on Small Groups | Pastor Joe Quatrone, Jr. This is a new blog I am following and really like the posts. Check it out!